Upcoming construction prompted staff to search for the capsule a year early. 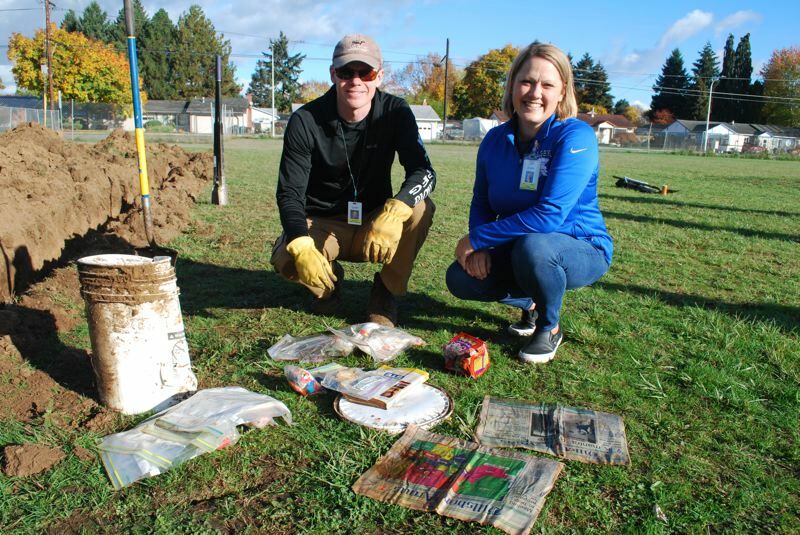 Two decades ago, a first grade class at Brookwood Elementary School buried a time capsule in the school's backyard with instructions to dig it up in the year 2019. Those plans came to pass a year early, as district officials prepare to demolish and rebuild the school next year. Construction will soon begin on the largest of the 2017 Hillsboro School District bond projects — the complete demolition and reconstruction of Brookwood Elementary School. Several students from the class of 1999 and staff members gathered Friday morning, Nov. 2, at the school, 3960 S.E. Cedar St., to begin their search for the time capsule before site work begins next year. "We knew that it was 47 feet from the back property line, (but) we didn't know exactly where it was because when I marked it with a GPS 20 years ago, GPS technology wasn't super accurate," said former Brookwood first grade teacher Terry Sayre, who now teaches at Tobias Elementary. "We ended up digging quite the trench and we ended up finding it kind of at the end where we were about ready to give up, so I was very pleased that we found it." It took two hours and a 60-foot-long trench before it was found buried two feet below the surface, said Bond Communications Director Jane Siguenza. "Unfortunately, the plastic bucket was crushed a bit and so the contents had to be removed," she said. "The plastic bag holding everything had water leakage, so unprotected items were waterlogged, but salvageable … Although we had to violate the "do not open" directive due to the damage to the bucket, I believe items will be kept in their individual baggies until next year." Brookwood Principal Michelle Jensen — who assisted in the search Friday —said the school will do its best to preserve as many of the items as possible. "The timeline (for revealing the items) has changed because it was broken," she said. "We planned to do this a year from now, (so) we are trying to formulate an appropriate plan about how to reveal it to the kids and share the things with them that we found." The items will be put on display in the new school, Jensen said, so that parents and kids will be able to see the time capsule's contents for years to come. "If we are not able to preserve everything, we will take photos the best that we can so that we can show kids what other students 19 years ago felt was important for us to see," she said. 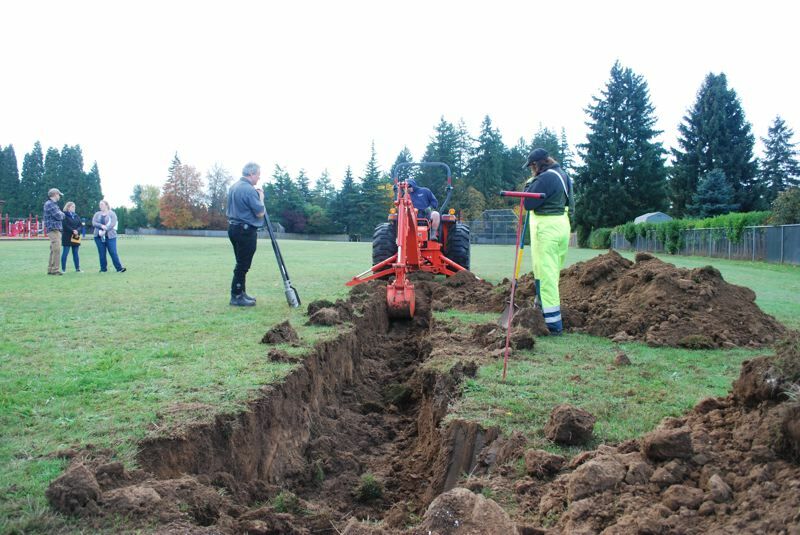 Sayre, whose students buried the capsule almost two decades ago on Dec. 16, 1999, said he was grateful to the Hillsboro School District for supporting him in finding it before the school is demolished. "It's a little surreal because that was my second year teaching and now I'm on my 21st year teaching, so it just makes me feel like time goes by super-fast," he said. "But it was good to see and take a trip back through memory lane. I actually got to see one of the students I had (in 1999) ... which was really fun." Jensen said Friday's experience was a special recognition of the school's history having both Sayre and his former students there. "That was really fun to be able to have (Sayre) come and it wasn't just him there, there is a group of students that had put things in the capsule and they came to watch and wait," she said. "It was a little bit like looking for a needle in a haystack, but we dug a long trench and we found it. ... It's super exciting, especially for those that were part of the initial burying of the time capsule." Construction will begin June 2019 and is projected to be wrapped up in August 2020. A farewell event will be held before the old school goes away, as well as a dedication of the replacement school, Siguenza said.